Filled with the grace of God, St Parthenius from age eighteen healed the sick in the name of Christ, cast out demons and worked other miracles. Learning of the young man's virtuous life, Bishop Philetus of Melitoupolis educated him and ordained him presbyter. The people began to turn from their pagan beliefs, and the saint went to the emperor Constantine the Great seeking permission to tear down the pagan temple and build a Christian church in its place. The emperor received the saint with honor, gave him a decree authorizing the destruction of the pagan temple, and provided him with the means to build a church. Returning to Lampsacus, St Parthenius had the pagan temple torn down, and built a beautiful church of God in the city. In one of the razed temples, he found a large marble slab which he thought would be very suitable as an altar. The saint ordered work to begin on the stone, and to move it to the church. Through the malice of the devil, who became enraged at the removal of the stone from the pagan temple, the cart overturned and killed the driver Eutychian. St Parthenius restored him to life by his prayer and shamed the devil, who wanted to frustrate the work of God. The saint was so kind that he refused healing to no one who came to him, or who chanced to meet him by the wayside, whether he suffered from bodily illnesses or was tormented by unclean spirits. People even stopped going to physicians, since St Parthenius healed all the sick for free. With the great power of the name of Christ, the saint banished a host of demons from people, from their homes, and from the waters of the sea. Once, the saint prepared to cast out a devil from a certain man, who had been possessed by it since childhood. The demon began to implore the saint not to do so. 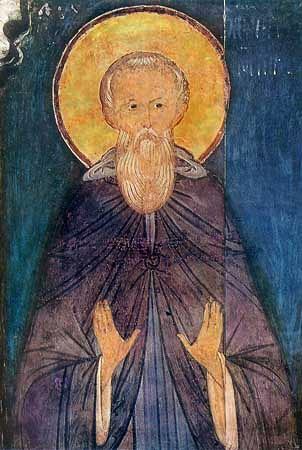 St Parthenius promised to give the evil spirit another man in whom he could dwell. The demon asked, "Who is that man?" The saint replied, "You may dwell in me, if you wish." The demon fled as if stung by fire, crying out, "If the mere sight of you is a torment to me, how can I dare to enter into you?" 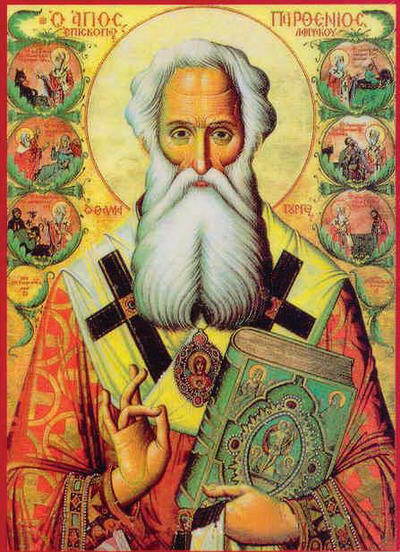 wise and holy God-bearing wonderworker Parthenius. and drove out evil spirits. Therefore, we praise you as a great initiate of the grace of God.